A section is the cross section geometry of the member. Different sections have different bending, shear, and torsional properties. Sections can be created in two ways. Material ID - The material of the section specified by ID. The datasheet can only be used to view sections. It cannot be used to add or edit sections. If the shear areas are specified then shear deformation is taken into account (i.e. the member using the section is considered a Timoshenko Beam). In most applications the shear deformation is negligible compared to flexural deformations. When the shear areas are not specified in the sections form then the shear area is taken as infinite, meaning that no shear deformations are accounted for (i.e. the member using the section is considered a Euler-Bernoulli Beam). It is recommended to keep the shear areas empty as shear deformation is usually negligible. SkyCiv's Section Builder is integrated into Structural 3D and allows users to quickly and easily model various types of sections. Points Shapes - Define points to create a polygon. Specify fillets at any point. Line Shapes - Define a line path and create a polygon with a thickness and radius. 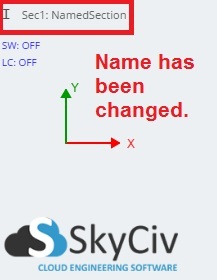 Importing DXF - 2D shapes drawn in external CAD programs can be saved in DXF format and imported into SkyCiv's Section Builder. Built up sections can be modelled by adding multiple shapes and performing operations (translating, rotating, mirroring) on them. Composite sections can be modelled by assigning different materials to different shapes. Holes and cutouts can be specified by checking the "Cutout" box. Clicking 'Calculate' will display a summary of the geometric, bending, shear, and torsional properties. It will however not submit the section to the section ID. Clicking 'Submit' will assign the section to the section ID. Members assigned with this section ID will have this cross section. It is important to note that when a member gets assigned to a cross section, the line of the member always acts through the centroid of the section. 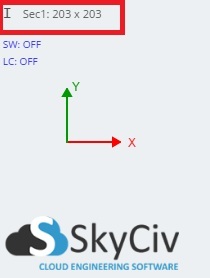 This is to clarify that the (0,0) coordinate (origin) of the section builder is not by default the centroid. You can sketch and translate your section anywhere on the z-y cartesian plane, and the member will be assigned to the true centroid. Translations and rotations of shapes allow for relative positioning of shapes when creating a section that is made up of more than 1 shape. If you don't want the line of the member to pass through the centroid, then you can use the "Offset A" and Offset B" of the member. 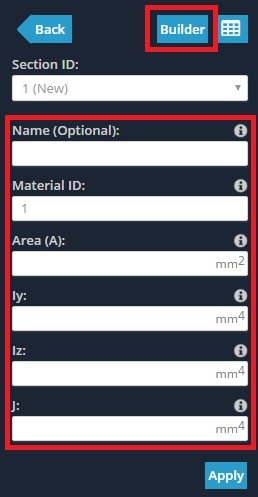 By default, when you add your sections, they will be named by their (rounded) height x width dimensions. To the left of the name will be an icon representing the section (e.g. in the example below the "I" icon represents an I-beam). This may not be meaningful to you so you can optionally change the name. To do this, simply click the section to bring up its menu options on the left. In the "Name (Optional)" field, enter in a name you prefer. For example, I've made this change and the result is now as below.